When vacationing in new country it can be stressful trying to communicate with locals and find your way around if you don’t speak the native tongue. Most people will try to learn a few key phrases, or maybe buy a pocket dictionary before their travels. When it comes to businesses though, most industries tend to have jargon they speak, and as a consumer it can be just as frustrating. We believe that educating our clients is one of the best ways to ensure customers are happy with their decisions, and to help out, or as a little refresher, we pulled together a list of words you might hear in a carpet store, so you can feel a little more confident the next time you come by. The easiest way to describe the warp is that is it’s the vertical yarn. In some cases, it is visible (see flat weave). In most carpets though, the knots are tied to the warp. The weft is the horizontally thread going over and under the warp. In a flat weave, it is what you see, and in any other kind of carpet, they keep the carpet together. The hand of a carpet, just like the hand of a fabric, is the feel. The had can be soft, coarse, smooth, light, or many other things. It’s just a technical name for how the carpet feels and acts under touch. Most rugs are woven on vertical looms, and where the weaving starts becomes the dark side of the carpets. This is because the fibers fall in one direction, so there is a smooth side and rough side to the carpet. Looking at the smooth side, colours will appear more subdue. We recommend that you look at wool and silk carpets from the soft side, because the silk will shine. Looking at the rough side, there is less reflected light, and colours will appear bolder. The pile of the carpet is the thread that sticks up from the knots. Shaved carpets have little to no pile, while shag carpets have a long pile height. Loop and cut carpets combine threads that are looped with threads that stand straight. This can be used as a technique to create interesting textures and patterns. You can see an example below of Piece no. 27558, where the beige is a looped wool and the cut pile is plum bamboo. A cut pile carpet is simply when the loops of pile that are created during the weaving process are cut. This is the majority of carpets that we carry at W Studio. Over dyed is when an old carpet, or new carpet, is given new life by being re-dyed. Some of the original pattern may show through the new dye colour, but generally in an uneven fashion. This creates a fun and playful feel, as it can be done in very vivid colours. A hand knotted carpet is the traditional way of making carpets, and dates back thousands of years. The number of artisans weaving the carpet depends on the carpet width. This style of weaving can take months, and sometimes years, to finish. When a carpet is hand tufted, a person with a hand-held tufting gun to shoot yarns onto the backing, it takes less time to create a carpet using this method than it does to create a hand knotted carpet. A high-low carpet infers that some of the carpet pile is higher than others, usually in the form of a pattern or a different colour. This can be done in tone on tone, with different fibers, or it can be very intricate. Flat weave carpets are made by weaving together the warp and weft. There is less material used here than in a knotted carpet, but there can still be many patterns and interesting textures that can be made with a flat weave. Using the same size warp and weft can create a very uniform looking carpet, but varying the sizes can create something more playful. Below you can see a close up of a flat weave, Piece no. 27715. Broadloom is a term for carpeting that runs wall to wall. There are many different styles, patterns and types of broadloom available. Traditional or classic style carpets are carpets with patterns that are based off the old weaving look. They used to be used to tell a story of the artisans’ town, but can have many different styles and motifs within them. The patterns are generally balanced and have a border. Piece no. 16088 is a beautiful traditional carpet. Transitional carpets generally pull motifs from traditional/classic styles, but generally don’t have a border, or have a more heavily repeated pattern. Piece no. 27762 is a great example of a transitional carpet. Contemporary carpets can feature graphics or can be abstract, and can even have a graphic pattern. This term is more a catch-all for carpet that don’t fit within the other two styles. Piece no. 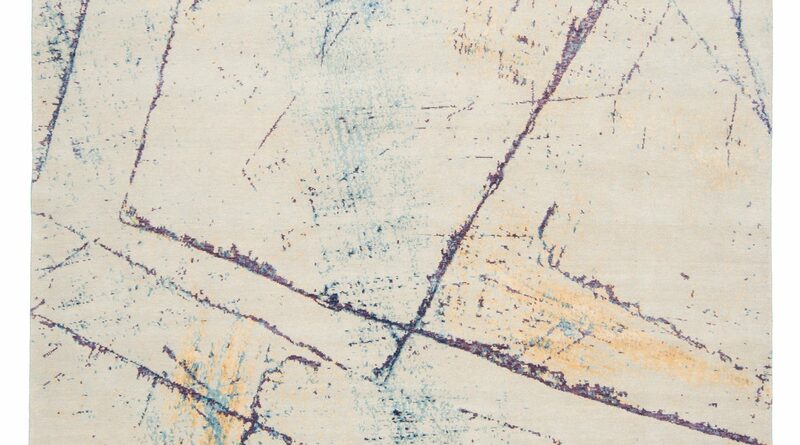 27710 is an example of a contemporary carpet. Some carpets have fringe at the ends of the carpet, which is generally an extension of the warp of the carpet. It can be cut short or even cut off in some cases depending on personal taste. Not all carpets have fringe. Piece no. 27794 had quite long fringe. Knots per square inch means exactly what it says, but it can imply a few different things about the carpet. Carpets with a higher knot count can have more intricate patterns, with a higher resolution. A higher knot count takes more time to be woven, making them comparatively more expensive than carpets composed of the same type of material in the same size with a lower knot count. When a carpet is on loom, it just means it is in the process of being woven. Before a carpet can be put on loom, the raw materials need to be gathered, dyed, and spun. We hope that this has helped educate you a little more on the world of carpets! For a full educational experience, come in to 1330 Castlefield Ave, or call us to book an appointment at 416.929.9290.